This part replaces the front crisper support in your refrigerator. It is sold individually and mounts to the inside cabinet wall. Part Number 241993101 replaces: 1513082, 240423701, 7241993101, AP4427109. I watched the video you had on your website---really easy-you guys ROCK! Pulled the broken support out and placed the new one in using my rubber mallet. Not instructions, more what I experienced. Watched a video on youtube, 5 minutes later I had replaced two supports and had the crisper reinstalled. My wife was amazed. I will be coming back to this site for all our appliance home repairs. Thank you! Crisper glass, bottom door bin and two crisper cover supports were broken. 1) remove crispers and crisper glass holders and broken bottom door bin.2) use screw driver to pry loose broken crisper cover support. 3) install bottom door bin by sliding into guides on the door from the top. 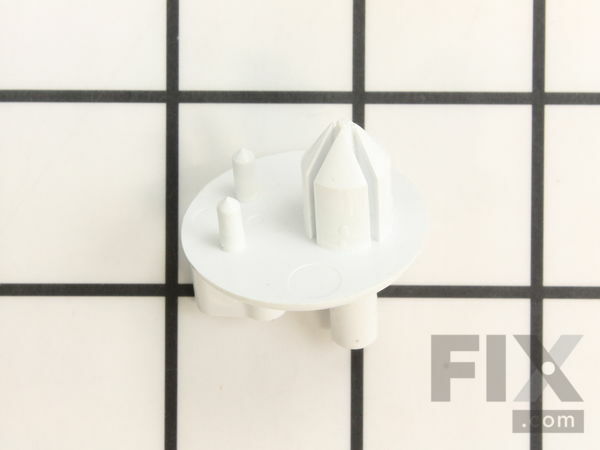 4) Install crisper cover support by pushing stud on support into appropriate hole in fridge wall. 5) slide in crisper glass holders on top of supports. 6) place crisper glass on top of holders ensuring that they fit into recess properly. 7) slide in crisper drawers into place. I watched the online video that the site posted. The part arrived the day after I ordered it! I took it to the kitchen, opened the refrigerator, placed the support in the spot, lightly tapped with a hammer and, within a few minutes, it was done! It really wasn't that difficult, but the video made it even easier. Thanks! Put duct tape around the broken supports to protect the side of the fridge. Used the hammer and the pin punch to drive the locking pin of the support into the side of the fridge. Took the putty knife and pried the broken support out. Used the pin punch to move the old locking pin out of the way. Put the new support into the holes. Used the hammer to drive the new locking pin into fridge. Drove it flush with the new support. Works great. We watched your u-tube video on your web-site. It was very clear and easy to understand. We punched the middle peg in to the frig and pulled out the broken posts. We then installed the new posts w/bracket and pounded in the middle post to flush with the bracket. Easy as could possibly be. Thank you so much. Ice build up in the evaporator. Im from Mexico, I had to buy all the parts in US, I made an overhaul to my refrigerator, also I replace the main control board wich has the defrost timer integrated in this mother board, tooks me more de 2 session of 2 hours each one to complete the whole reparation. The most difficult part was remove and install the defrost heater element, because you most handle with the evaporator, need patience and time, also was difficult for me to replace the main control box because the access to it in the bottom of the fridge, too norrow the space and too short the harness cables that connect to it. gasket, defrost control, crisper support and bulb, very easy. excellent service from this site. After almost 3 weeks the service guy I called at the begining is still looking for the parts, Im glad I did my self.